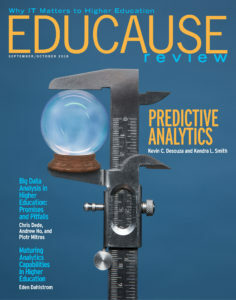 An article I co-authored with Kendra Smith appears in the September/October Issue of EDUCASE Review. The article was the cover feature for the issue. You can access the article here. With predictive analytics, colleges and universities are able to “nudge” individuals toward making better decisions and exercising rational behavior to enhance their probabilities of success.